Would you like a rant with your cheesecake? I’m gonna say it. I’m not a fan of substitutions. For example, you know those lil’ break-out boxes in those terrible women’s magazines you pick up to read on the plane sometimes? They kill me. ‘Want a handful of m & m’s? Substitute….a handful of sultanas. Want a slice of pepperoni pizza? Substitute ¼ of a piece of mountain bread with low fat cheese and a slice of lite ham. Profriterole? Granny smith apple. These are not substitutions, any more than a frozen banana put through the blender is ice cream. Even things that are similar are not. the. same. Brown rice may be a replacement for jasmine rice, but they are different in many ways. Brown rice doesn’t have the heavenly scent, soft texture and marry with south-east Asian food in a perfect union the way jasmine does. A glass of rice milk is nothing like a frosty glass of full-cream Jersey goodness. Cocoa nibs are not as delicious as a hunk of proper chocolate. And nothing, NOTHING is a substitute for butter, I don’t care what anyone says. The folks out there telling you that they are sooo looking forward to that second plate of kale chips? Trust me, they’re not. And if you *are* looking forward to these kale-y snacks, please don’t call them chips. Call them dehydrated kale chunks and be done with it. If you’re looking forward to your quinoa salad, by all means look forward to it, but *as* a quinoa salad, not as a substitute for prawn risotto with lashings of parmesan. They’re not even in the same league. So. I want to eat some cheesecake this week. And even though I still have a few kilos I would like to lose, I am going to have some. This is my actual cheesecake recipe, and it is actually a cheesecake. It doesn’t have a crust, but in all other respects, it is what it appears to be. The secret to making it ‘healthy’, whatever that means, is portion size. Make this into 6 tiny cheesecakes. Oh, and it’s piss-easy. So get baking. This recipe serves 6 and is best made a day ahead. Preheat oven to 150°c. Beat the cream cheese, sugar and zest together until smooth. Add the eggs, one at a time, beating until well incorporated. Add the juice and beat for about 30 seconds. Split mixture between 6 individual ovenproof dishes and sprinkle with fruit chunks. Boil a kettle. Place the six dishes into a large baking tray and fill the tray with boiling water to halfway up the outside of the dishes. Bake for 35 minutes, turn off the oven and leave to cool with the door ajar. Remove from oven and, once cool, refrigerate 3+ hours (I made them a day ahead and we ate them over the course of a week). Whaddya say, chums? Got any legit substitution suggestions? I have a friend, let’s call her Ms. G, who is in the habit of whipping up amazing and intricate dishes on a regular basis. I’m always excited to be invited round for dinner and luckily, she doesn’t live far and invitations are frequent. Ms. G is adept at homemade ice cream, paella, bread made from scratch, risottos…the list goes on. I’m amazed at her patience at skill and it’s serendipitous that she’s an expert in all those dishes I would never dare attempt. In my own kitchen, my absolute favourite recipes are those that involve minimal effort but yield maximum results. This probably has as much to do with my lack of patience as it does pragmatism, but nothing gives me more pleasure than recipes that are zero fuss and yet somehow, absolutely stunning. It never continues to amaze me how many recipes pack a massive flavour punch with very few ingredients, very little effort and very little time. Amaretti was one such happy surprise for me. I had always marvelled at their crisp outer shell and chewy centre, perfect with a ristretto or dunked in a cappuccino. Surely, I thought, they must be fiddly and time consuming to taste this good, something like macarons. 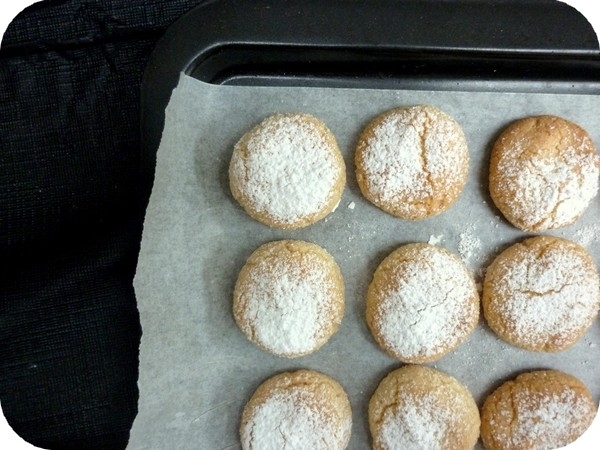 And yet these little Italian biscuits were as forgettable as they were delicious; in fact it wasn’t until about a year ago that I looked online for a recipe. I ended up selling some to a cafe for a while but due to their understated appearance, that didn’t last long. This is one of the easiest and fastest biscuit recipes you will ever make in your life- all you do is whisk a few ingredients together with a fork, roll the mix into balls and bake. Enjoy! Preheat oven to 175◦c. Line two biscuit trays with baking paper. Beat sugar, almond essence and egg whites together with a fork until smooth. Stir in almond meal with fork. With dampish hands, roll small amounts of the mixture into balls of 2-3 cm in diameter and place on trays. I usually fit about 11 per tray. Flatten them with your fingers and dust liberally with icing sugar. Bake for around 12 minutes. They should not be brown, just starting to get a touch of colour on them. Cool for one hour before serving and/or storing in an airtight container. Makes 25 amaretti, which will keep for up to 2 months. Makes a great Christmas gift! So, readers, do you have a favourite no-fuss treat?